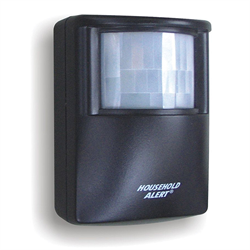 The Skylink LONG RANGE Motion Sensor expands their Home Alert Long Range Kits The motion detector can be used indoors or outdoors and has a maximum range of up to 800 FEET. When motion is detected it sends a signal to the wireless base station. When triggered, the base station will flash an LED indicator and beep to indicate and alert. The beep volume can be turned down or off. Dimensions: 2 1/2" x 3 1/4" x 1 3/4"